In this post i will show you how can you extract juicy information from an image like when it was created,modified ,what camera were used and lot of other info.This method could be useful for starting a Image forensic even it would not enough for some forensic research but at least it can give a good start.This can also be useful if you want to review your picture like what was the shutter speed , It’s copyright information, Camera Model this information can be very useful for photographer if they want to find out what camera or settings were used for some particular photos. 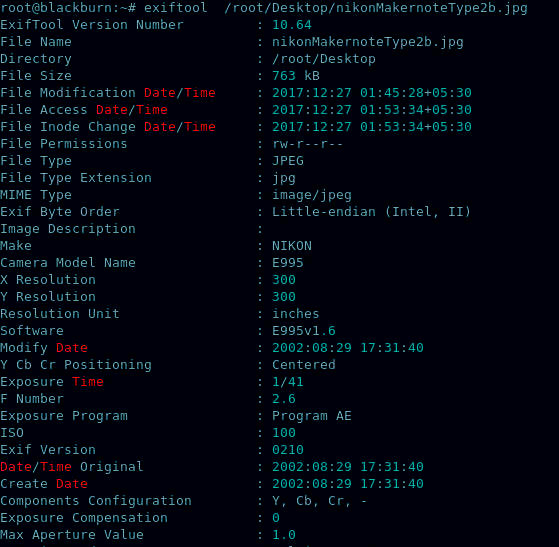 Now to run it type exiftool then your image location which you want to inspect, for example my image is stored on desktop so i will type exiftool /root/Desktop/sample.jpg and press return. If when you took the photo the gps tag wasn’t on, shouldn’t have the gps tag. EXIF metadata has been around for years! There are programs that can output the entire data if need be. People should note if they upload an image to Facebook, ALL EXIF-metadata is erased, and your image is now the copyright of Facebook. If you ever read the terms you will see this is true, and you wonder how you are worth money on Facebook.